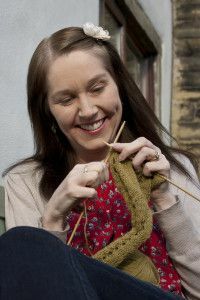 Baa Baa Brighouse is an online yarn store, specialising in British and in particular, Yorkshire yarns, that have been reared, sheared, spun or dyed here in ‘God’s Own County’. Founded in 2014 by seasoned knitter Elaine Jinks-Turner, Baa Baa Brighouse has grown and now stocks a beautiful range of carefully selected wool-rich yarns from well known brands such as Rowan and West Yorkshire Spinners. As a champion of small yarn producers, Baa Baa Brighouse is extremely proud to run a monthly subscription club – the Yan Tan Tethera Yarn Club, which seeks to showcase the very best that Yorkshire indie dyers have to offer. In Spring 2016, Baa Baa Brighouse launched its very own brand of hand dyed yarn – Baa Baa Brew. ‘The Brighouse Collection’, which features an ever expanding repertoire of subtle semi-solid colours, is a beautiful 100% British Bluefaced Leicester DK yarn. Each colour is named after an area of Brighouse, the town in which it was dyed. 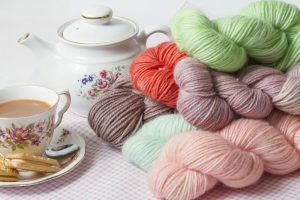 The following year Baa Baa Brighouse released their Baa Baa Brew Marble 4 Ply yarn and in 2018 introduced Baa Baa Blends and Baa Baa Beats along with themed and special occasion yarn boxes. Baa Baa Brighouse also stocks knit kits, needles and hooks, a range of pattern books, project bags and knitting accessories. In our handmade section, you will discover unique and original hand crafted garments, all knitted by Elaine, including scarves, shawls, wraps, hats, gloves and bags – each one a little different from the last, with a definite vintage feel. The majority of the yarn used in the handmade garments sold at Baa Baa Brighouse is sourced, spun and dyed locally, creating beautiful one-off pieces and in turn, supporting the vast woollen heritage of Yorkshire. If you like what you see, be sure to look out for Baa Baa Brighouse at local artisan craft markets and wool festivals.